The Skoda Fabia vRS is one of those rare sports models that's actually more famous as a diesel. After all, that's what the first batch of first generation vRS cars had under their bonnets, and they were absolutely beloved by the tuner crowd who adored the fact that a tiny diesel Soda hatch could be souped up to embarrass Porsches. Albeit in a huge cloud of black soot. The car we take a look at here isn't a diesel at all. It's the vRS model that Skoda launched as part of the second generation Fabia line-up and was a car that didn't appear until the brand got around to facelifting MK2 Fabia in 2010. This time round the vRS was quick right out the crate, with a 1.4-litre TSI twin-supercharged petrol engine doing the business. Here's what to look out for when shopping used. The 2010 model year updates to the Fabia were unveiled at that year's Geneva Show and comprised new engines, a fresh face and a whole raft of technical refinements. We had to wait until July to get our hands on the vRS sports models arriving in July, but it was worth the wait. A supermini with 180PS at its elbow is always something seriously good fun. Skoda also offered the model with its estate bodystyle. The brand does tend to love a special edition or two and in November 2010, the first of this shape arrived in the form of the rather lovely vRS S2000 to commemorate Skoda's success in the Intercontinental Rally Challenge. The front of the car got a minor tweak at the start of 2013, with the Fabia now wearing the revised badge and sporting Skoda lettering on its bootlid. In June 2014, the replacement Fabia was announced, which was duly unveiled at the Paris Motor Show in October signalling the end of this MK2 vRS model's production life. 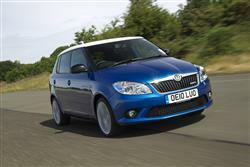 The Fabia has quite a distinctive shape for a modern supermini with its long bonnet and large glass area. The vRS version inherits these basics and adds a collection of design features that suggest it might be a little quicker than the norm. Redesigned bumpers extend further downwards, giving the car a lower, more athletic stance. At the back, a diffuser is built into the bumper along with twin exhausts and a subtle spoiler is added above the rear screen. Buyers also get 17" alloy wheels with red brake callipers peeping through the spokes. The vRS exterior couldn't be ranked amongst the most eye-catching in the hot hatch class but it successfully gives the five-door Fabia a sharper sporting edge. The interior is even more reserved with dark plastics and trim materials similar to the standard Fabias. Reminding the driver of the potential under their right foot are alloy pedals, a three-spoke leather steering wheel and cloth sports seats with vRS badges on the backrests. As in all Fabias, build quality is impressive and there's plenty of space for four occupants with a particular surplus of headroom.Just as unorthodox is the fact that the Fabia vRS can be ordered either as a five-door hatch or an estate. If you're after a fast small car that will go all but unnoticed, the vRS estate will be tough to beat. There certainly aren't many alternatives that can offer this kind of pace along with a 480-litre boot capacity for similar money. Fold the 60/40 split rear seats flat (a less than straightforward operation that involves removing the headrests) and there's an Albert Hall-esque 1,460-litres to play with. The Fabia hasn't always enjoyed a spotless reputation for reliability, with the first generation cars having quite a patchy record. The second gen model tightened quality up markedly and the facelifted version went another stage further. There are still some residual electrical and suspension niggles that have refused to go away, but on the whole, the Fabia scores well above average for reliability. The vRS is a bit more of a specialist thing than the rest of the range, so check that there's life in the front tyres and that the brakes have some meat left on them. This generation car is lighter at the front than the old one, so it's a bit easier on its tyres through corners. Look for accident damage and also steer clear of cars that are fitted with non-standard engine modifications. Extreme chip tuning of this 1.4-litre engine can cause all sorts of issues. The DSG transmission should engage all gears cleanly with no flaring of revs between upshifts or refusal to downshift into corners. (Estimated prices, based on a 2012 Fabia vRS) An alternator is a big ticket item at around £450, while a clutch assembly is around £215, making these parts of the Skoda ownership experience as upmarket as Volkswagen claim. Front brake pads are a reassuring £50 a pair, whilst a starter motor is around £135. As if to confirm its status as the sensible face of hot hatchback motoring, the previous generation Fabia vRS had an elderly diesel engine. It was far from the disaster that it sounds but the majority of buyers in this sector at the market will feel more affinity with the 1.4-litre TSI petrol unit in today's car. The engine is actually turbocharged and supercharged, helping it to a maximum power output of 180PS and a 0-60mph sprint of 7.3s. The turbo works at the top of the rev range while the supercharger boosts low end torque to levels that might be familiar to owners of the old diesel vRS Fabias. The 1.4 TSI twin-charge engine works on the principle that even modern turbochargers take a while to get into their stride and inserts a supercharger into the mix that can boost performance at low engine speeds while that happens. With turbo and supercharger working in tandem, maximum torque is produced over a much wider section of the rev range, giving the car greater flexibility. In a compact front-wheel-drive model like the Fabia vRS, the engine has added benefits in the shape of its light weight. This reduces the forces acting on the front wheels while they're working at important jobs like deploying the power and steering. Also helping put the power onto the road is Skoda's XDS electronic differential which uses the car's stability control system to mimic the action of a mechanical limited slip differential for greater control under hard acceleration. The DSG twin-clutch transmission also helps drivers get the best acceleration figures from their vRS. The second generation Skoda Fabia vRS is one of the forgotten hot hatches. So much fuss was made of the Ford Fiesta ST and the Renaultsport Clio that the Skoda just soldiered on in the background, quietly picking up sales but never really enjoying any time in the limelight. As a used buy there's a lot to be said for it, especially if you can pick up a low mileage example.